3.7 out of 5 based on 36 bloggers and 5 commenters. 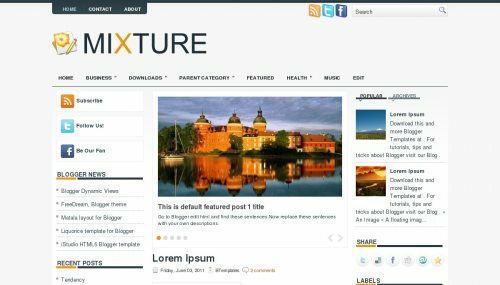 Mixture is a free blogger template adapted from WordPress with 3 columns, magazine-styled, left and right sidebars, rounded corners, ads ready, footer columns, slider, posts thumbnails, tabs and drop down menu. the thumbnail image which is coming with the posts are not appearing properly. All images showing on the above templates are cropped and appearing like a border. This error is existing on many of your templates… please take a look. Pls Guide me how to get ride of this error. Also, the images are all of a sudden gone. Is that Blogger’s hosting? The various Follow and Share and all of those images are not working. Amazing template though! Nice template.. May i download it?